Garage: "Garage: 2 Car Attached; Parking Space(s): 6"
Lot Size: 5446sq. ft. 56ft x 101ft "Irregular"
Extra Large Modified Bi-level with 1760 Sq. Ft. up & 1400 Sq. Ft. 3 Bedroom Legal Suite with separate outside entrance & Main floor entrance to Suite - so this can be 6 Bedroom Family Home or Revenue. Spacious & completely finished up & down. Quality Build with 3 + 3 Bedrooms, 3 Bathrooms, 2 Separate Laundry rooms, 2 x 6 walls, Triple pane windows, Double Attached Garage (with Heat feature). Beautiful Kitchen with Custom Cabinets & Island, Master Bedroom features large Walk in closet, 4pc ensuite & exits onto Open Loft Den/ Office. Fully Developed Basement 3 bedroom suite but can easily be used as Family living space with Extra Large Windows, Spacious Living area / Kitchen, 3 Bedrooms & 4 piece Bath. 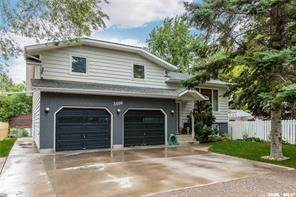 The yard is completely Fenced & Landscaped & offers low maintenance Back yard with Deck, Underground Sprinklers, Triple Concrete Driveway & Shed. Also Includes Central Air, Central Vac, Natural Gas BBQ Hookup, 9 Appliances & More! This Ideal Montgomery location is close to elementary schools, parks & South Bridge Access. Come view this Beautiful Home & compare this completely Developed Home's Square Footage, Price & Finish to any of the New Neighborhood Homes - Good Value! !